The Philadelphia region is home to some of the country’s oldest and most trusted coin shops. When buying silver in Philadelphia, keep in mind that the sales tax rate here is currently 8%. For bullion or rare coins, Delaware Valley is among the highest-rated Philadelphia coin shops. Specializing in early U.S. coins, this coin shop was founded in 1969. 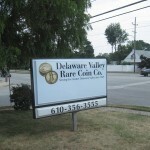 As one of the most trusted names in rare coins, Delaware Valley Rare Coin Company offers a number of special services for coin collectors. These include professional appraisals, layaway plans, wish lists to help you locate the specific coins you wish to add to your collection, and knowledgeable numismatic professionals ready to assist you. The shop is located in Broomall, Pennsylvania, just a few miles from Philadelphia. International Coins Unlimited, Inc. is a Philadelphia, PA coin dealer specializing in coins and precious metals. They run an active buying program, and purchase jewelry, historical documents, paper currency, sterling silver, and other items in addition to U.S. and foreign coin collections. This active buying program means the selection available in-store is frequently changing, so you’ll always have a chance to see something new here. With 48 years of experience, International Coins provides knowledgeable, friendly service whether you’re a beginning collector or an experienced investor. South Street Coin & Jewelry Exchange is one of the oldest coin dealers in the region, with more than 70 years of experience buying and selling coins and bullion. Over its history, it has built a reputation for high-grade coins and professional service. The selection here includes bags of 90% and 40% silver coins, bullion such as 1oz, 10oz, and 100oz bars, silver and gold American Eagles and Canadian Maple Leaf coins. South Street Coin also stocks a wide range of U.S. coins, and promises to find any coin you’re after if you don’t see it here. 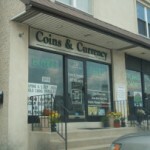 A coins, bullion, and scrap metal dealer located just minutes from Philadelphia, Coins & Currency of Wayne was founded in 2002 and is a PCGS and NGC Authorized Dealer. Already the shop has gained a reputation for competitive pricing and friendly service. Owner and operator Frank Hendrickson brings more than 40 years of numismatic experience to this coin shop. The selection includes United States and world coins and currency, as well as gold, silver, and platinum bullion. This Pennsylvania coin shop also buys and sells precious metals and jewelry and carries a wide selection of stamps and stamp collecting supplies.